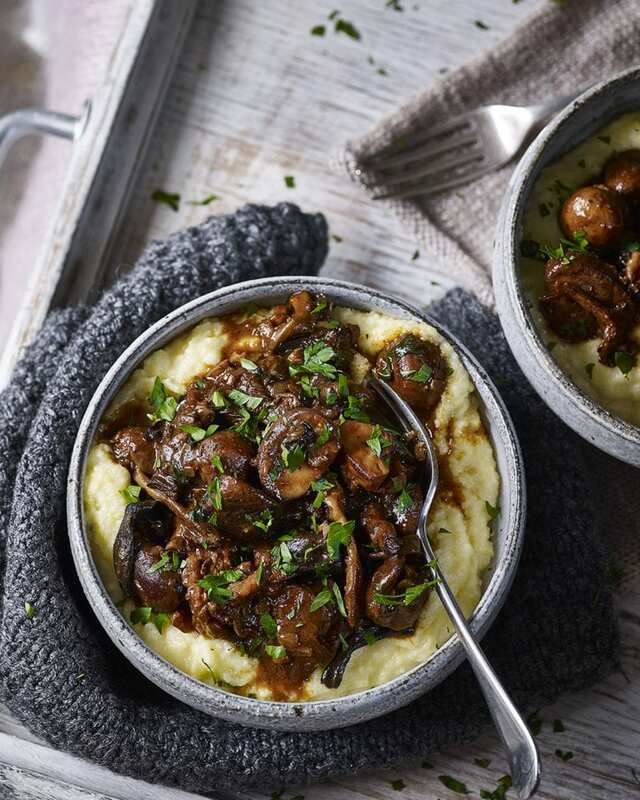 Get cosy with our full-of-flavour vegetarian stew made with wild mushrooms, garlic, maderia and pickled walnuts. Serve with a creamy, buttery polenta for the ultimate comfort food dinner. Soak the dried mushrooms in 300ml boiling water from the kettle. Heat 2 tbsp of the oil in a large sauté pan or deep non-stick frying pan and fry the shallots for 10 minutes over a medium heat to soften. Stir in the garlic and cook over the heat for a minute until it smells fragrant. Meanwhile, in a separate large frying pan in 2 batches, fry the fresh mushrooms in the remaining oil and half the butter, stirring now and then, for 5-6 minutes until browned. Stir the flour and tomato purée into the shallots and cook for 2-3 minutes, then add the browned mushrooms. Pour in the madeira and let it bubble over a high heat for a minute or so, then turn the heat down. Add the soaked mushrooms, pouring the soaking liquid through a fine sieve into the pan (discard any grit left in the sieve). Add the thyme sprigs, chopped walnuts and pickled walnut, then simmer over a low heat for 25 minutes until rich and thickened (see make ahead). When ready to serve, make the polenta: bring the stock to the boil in a large, deep pan. Add the polenta in a slow steady stream, whisking all the time, until smooth. Cook, stirring, for 4-5 minutes until thickened (if it’s too thick, stir in a little boiling water). Take the pan off the heat, beat in the mascarpone and knob of butter and season well. Stir the remaining 25g butter into the stew with most of the parsley. Taste and season, then serve on top of the polenta in wide, deep bowls, scattered with extra parsley and walnuts, if you like. Cool, cover and chill the finished stew for up to 3 days. Reheat to serve. A soft Piedmont red such as barbera is perfect here – or a barolo for a treat.